It's kind of surprising that an innovation like a no-blindspot driver-side mirror wasn't created by the R&D team at a major automotive manufacturer, but instead by a mathematics professor at Drexel University in Philadelphia. That doesn't make it any less awesome, however. 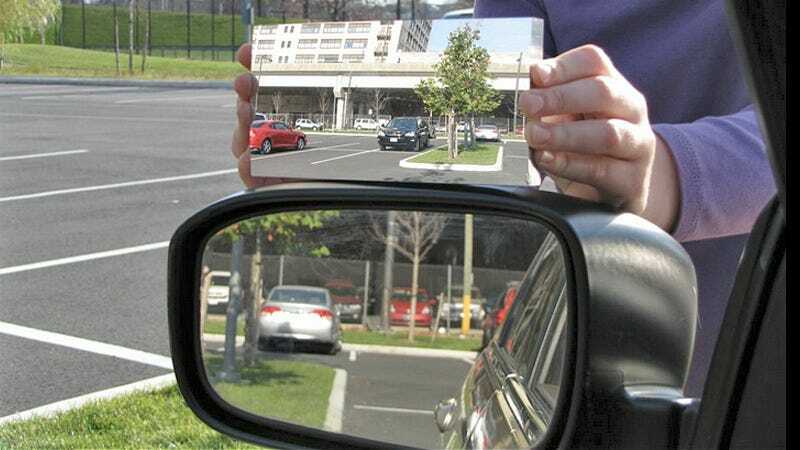 Using a specially-developed mathematical algorithm, Dr. R. Andrew Hicks, a professor at Drexel's College of Arts and Sciences, created the improved side view mirror with a 45 degree field of view, compared to just 15 or 17 degrees on a traditional side mirror. Not only does it completely eliminated a vehicle's blind spot, but it does so without grossly distorting everything, or making objects appear tiny and distant, like a wide angle mirror would. The secret to the new mirror's magic is its carefully engineered surface. It might look smooth, but it's actually made up of tens of thousands of tiny facets that are invisible to the human eye, but help properly bounce the light towards the driver so they see a wide, undistorted view of what's next to their vehicle. Unfortunately government regulations still require new vehicles to only come with flat side mirrors, but since the new mirror's design has been successfully patented, when it finally goes into production it should be available as an aftermarket add-on that will actually improve the safety of your vehicle.